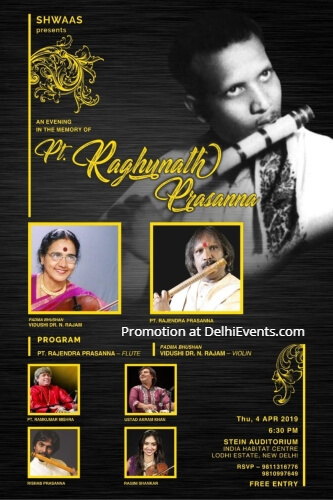 Event Description : MUSIC : Shwaas presents An evening of Indian Classical music in memory of Pt. Raghunath Prasanna. Flute recital by Pt. Rajendra Prasanna and Rishab Prasanna accompanied by Ram Kumar Mishra on Tabla. Violin recital by Dr. N. Rajam and Ragini Shankar accompanied by Ustad Akram Khan on Tabla.